This one isn't supposed to be an interesting design - it's somewhere between Baskerville and Bell - because I am trying to practice technique. But then boring is good for text faces, right? Basic uppercase is done, lowercase is still in adhesionland. I am particularly struggling with the balance between consistent stems and consistent color; I think the color is suffering at the moment. Any thoughts appreciated! A' leaning a bit to the right. C' bottom terminal too tight. N' might be too wide and stems not equal in thickness, diagonal maybe too thin. S' spine curves are too sharp, top part "shifts" right. U' improve bottom right cure. Y' left arm not parallel. Z' L' E' rounded serif tips not corresponding to C' G' and rectangular serif tips. Need to harmonise thin stems and diagonals thickness. /A serifs seem unbalanced in size. 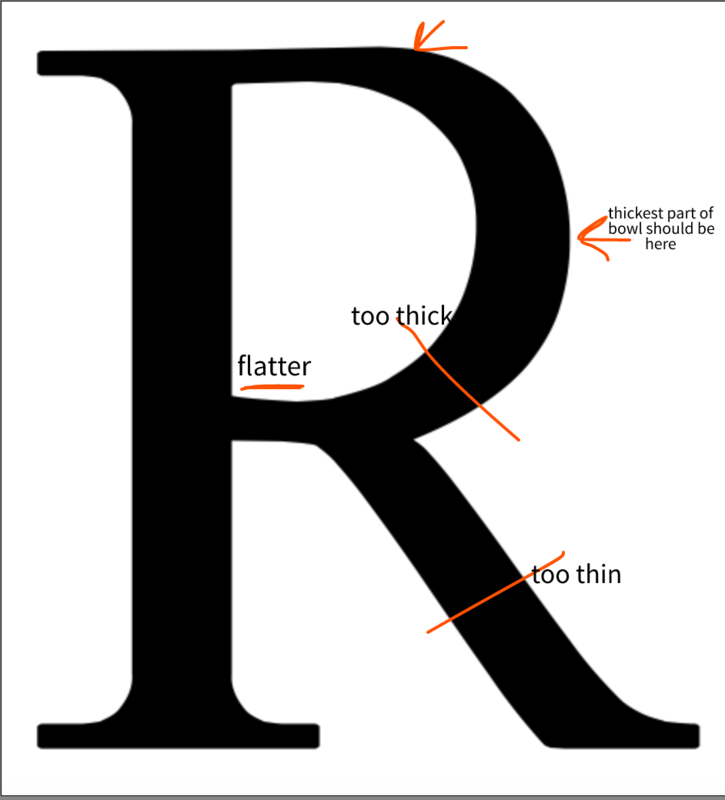 Left leg to thick; center bar should be thicker or optically equal in thickness to left leg. Top of letter too flat, you could either make it pointier or cut off at ~20° angle. /D too square, too narrow? /E center serif needs less bracket, bottom bar serif is too flat. Center bar too high up, bottom bar needs to stick out to the right more. /J see this image. I drew it badly, curve might not need to be opened that much in left example. Good chance i'm completely wrong about this. /N Contrary to what Ofir has said, i think the /N could be wider. Bottom right has too much overshoot. Left vertical stem, as in the /M is too thick and the right vertical stem is much too thick, it should match the left one. Serif on top right, the right side is larger than the left. Should be balanced, or left side bigger than right. 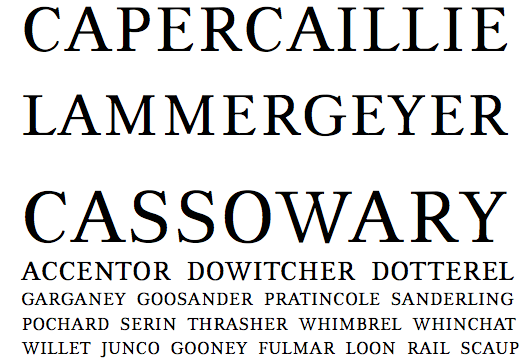 /O much too narrow to match any cut of Baskerville or Bell. Bowl shape consistent with most letters which is nice. /P Size of bowl doesn't look nice next to /R. Either bowl or /R needs to be smaller or bowl of /P could be bigger. only a tiny bit tho. Bottom part of bowl looks a little too thick. /S Spine shape should be less square, more round. Bottom left doesn't go up enough; serif should be larger than top right. Top part out too far the right, looks like it's falling over. /T Top left and top right serifs are not large enough, consider spurs on top. Vertical stem flares on top, which is inconsistent to the rest of the font. /U Top left serif not consistent left and right. Top right serif not large enough. Throughout bowl, the stem gets thick and thin in weird places. /W Stroke widths are inconsistent. > Check the left side serifs on /B /D /E /F /L /P /R they are not consistent in size. The serifs on the /I can be extra big, but it looks like you copy pasted this to some of the other letters and not others. In lowercase, the letterspacing is generally to big and the width of the space is too large. Many of the curves need smoothing out. Go through and check that stroke widths are consistent. Remember that the max width of a bowl ( such as /o) will need to be thicker than a vertical line (such as /l). /e is especially weird. Note how top serif on /i and /l are not the same size. Go through and check which serifs are pointy and which are blunt. Change the ones that don't fit. > boring is good for text faces, right? That's useful and commendable. But it's possible to do both. I don't like the middle of /W. The left stem joins the right low enough to break the optical illusion that it joins it at the apex, but not low enough that it's seen as deliberate. Thanks all for the detailed and helpful feedback. I will revisit all of these points and see how I get on, which will take me a while. I think I have misunderstood the role of serifs! Designing Type talks about how you need to make them different sizes in order to provide different amounts of balance, but it looks like I'm not yet applying that differentiation in the right way. Back to the drawing board! Lots of people have figured out serifs. I figure out serifs several times each day. Here's the latest version of the UC, with (hopefully all) the suggestions above integrated. No comparison, really. the bottom right Serif might go a bit to the right? 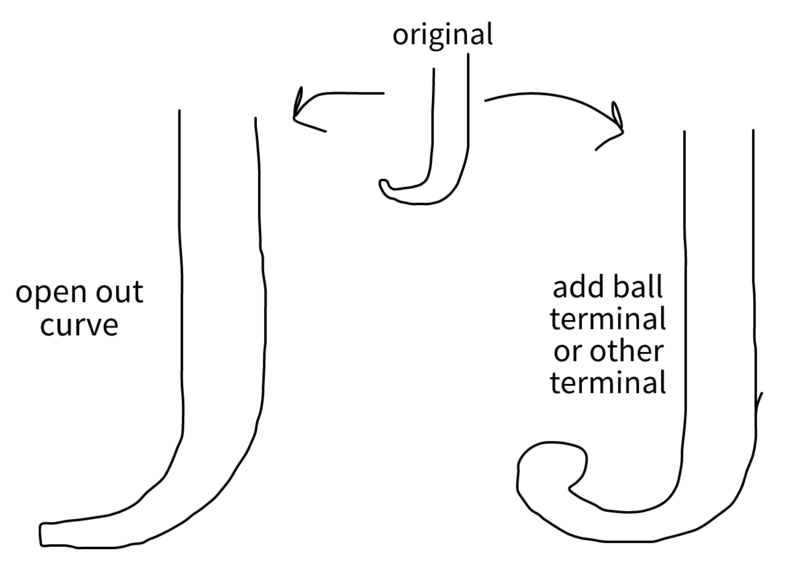 And the connection between the tail and the round shape of the Q.alt can use some smoothing.